On our 'Amazon Fire stick' we have the option to Sign in or press the 'Back' button on the controller to watch without signing in . It is debatable, whether BBC conteht is free of ads. i think it's fair to say it has "promotional content", but it's not "paid advertisement" and general consensus would be that an advert would involve payment of some kind in return for showing the advert. You get most of that rubbish on BBC Terrestrial TV anyway so there's not much difference. Enjoy it while it lasts. That was how my Panasonic TV App behaved too, until yesterday. I would not be surprised to find that the iPlayer App on the TV had silently updated itself, to a version that needs sign in. The Panasonic Firefox OS pretty much forces you to let it update Apps on its own whim. Maybe I am not remembering correctly but I had a feeling I was asked to update the iPlayer recently on one of my devices because the current one was not supported so if I do remember that correctly you may well find you have no choice. After selecting Sign In, the App gave me a code, instructing me go to a computer and register that code. But underneath, there was another option... “No mobile or Computer”. Looked promising. A phone number was then presented, that would issue me a “guest” sign in code. Better still, the Guest sign in would be stripped of all the “personalised features”, that I’m sure will just annoy me. So I phoned the number and yeah, there’s a catch, the guest code is only valid for one day! I’m guessing that this interface probably pays lip-service to some clause in the BBC charter that prevents them from restricting iPlayer to those with computers, without actually having any intentions of being useful. I could do that that until just over a week ago. I held out as long as I could. Within the past couple of weeks, both my Smart TV and the firesticks will no longer allow you to bypass the login. the guest code is only valid for one day! Signed for it myself last week ..... I need my fix of 'Only Connect' (The hardest quiz show on TV). (The hardest quiz show on TV). That doesn’t sell it to me, BS. I need easy quizes. Tonight, I’ve been playing some more with the Apple TV App. I’d never given it any attention as the Panasonic TV already had an App. But actually, I think I really like the Apple TV version. Not only does it not require sign in, or even (apparently) support sign in, but the UI is infinitely better than the UI on my TV ever was. With the Panasonic App, I never did figure out how to just stop playing a programme, exiting back to the previous page, so I could select something similar. It always went all the way out to effectively, the entry page, requiring me to reselect from the menu then wade through several screens of unwanted icons, just to get back where I’d been. Apple TV App on the other hand does the intuitive thing, gracefully unwinding back through the selections I have made. So it is easy to just go back one level and choose (say) a different archive ‘Horizon’. Long may it last, but I should probably prepare myself for disappointment. Good news is, I have kind of adapted to using iPlayer on the Apple TV App. It works, at least my current version. And still no need to register, or to sign in. Less good news, I found the old “Blackadder Goes Forth”, we watched it tonight. Very funny it was too. And at just over 29 minutes duration, no room for advertisements you might think, at least by the standards of its day, clearly targetting a precise 30 minute slot. Nope. As the credits unrolled, and as I enjoyed the classic music, suddenly a yapping voice butted in and dominated, encouraging me to watch something else. I have blotted out the details. Why would the BBC thing that such an interruption, “yap yap yap”, just when I am enjoying such a classic, would inspire me to ever watch iPlayer again let alone register my details and comprmise my privacy? interesting turn of events on this one. i don't have a tv licence at my new property - no requirement for one under the current terms of the licence. i registered the fact on the TVL website that none was required and it was processed as normal. this was some 3-4 months ago. yesterday i receive an email saying "our records show you've been using BBC iPlayer. 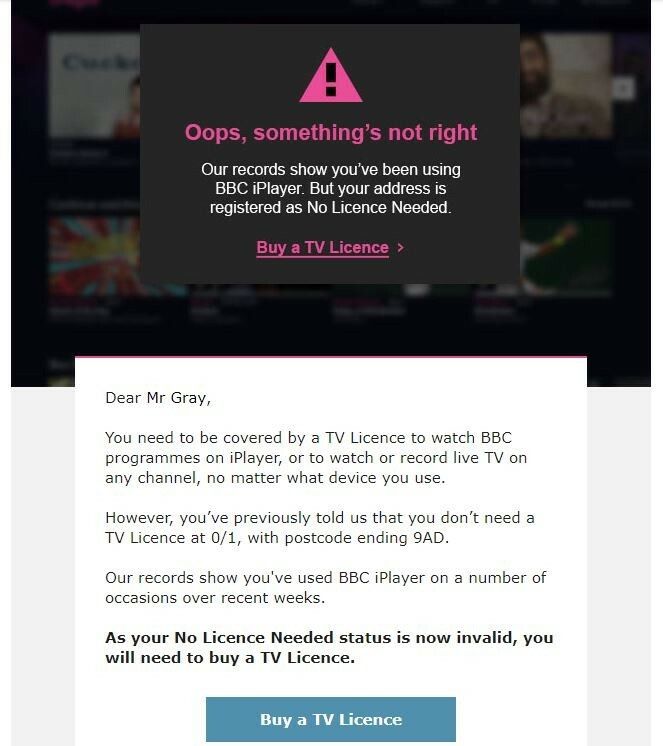 but your address is registered as no licence required"
You need to be covered by a TV Licence to watch BBC programmes on iPlayer, or to watch or record live TV on any channel, no matter what device you use. However, you’ve previously told us that you don’t need a TV Licence at 0/1, with postcode ending 9AD. Our records show you've used BBC iPlayer on a number of occasions over recent weeks. now, i'm curious as to why and how they think this is the case. i do have a BBC "account", but the only identifiable information it has for me is email address and postcode (which is the postcode of my previous address). i assume they have seen that account being logged on and used (still at the previous property, which is my parents house), and come to a conclusion that it must be getting used at the new property, which is incorrect. of course, i simply binned the email that TVL received, and if they wish to pursue i'll happily let them provide the evidence of it being used in this non-licenced property. as they are keen to remind everyone, the licence belongs to the property not the person.